What steps can we take to budget our time wisely and not be consumed with Social Media? 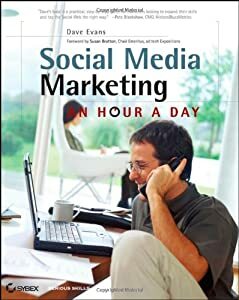 In Social Media Marketing: An Hour a Day, Dave Evans offers a step-by-step solution and it all begins with formulating a plan. Two books similar to this one on how to put together a business plan are: “16 Weeks to Your Dream Business” (ISBN: 9780071588362, and “Self Employment: From Dream to Reality” (ISBN: 1563709228). And a book similar to this one on how to put together a fundraising plan is: “The Fundraising Planner” (ISBN: 0787944351). The instant book being reviewed touches on the marketing issues of social media, and then devises a systematic approach to putting together a social media marketing plan customized to your small business. After reading this book, you will have developed a plan and decided whether to use Technorati, MySpace, Socialvibe, Flickr, Facebook, Friendster, Linkedin, and/or YouTube. Technorati is the tunnel through which to learn more about the blog or blogs you will create. This entry was posted in Book Review and tagged Business, Dave Evans, Linkedin, Myspace, Social marketing, Social media, Technorati, Twitter, YouTube. Bookmark the permalink.